Did you know? One in five of all websites are built in the popular open-source website creation tool WordPress. This system powers websites of all sizes, from everyday bloggers to huge business sites. A working knowledge of how to create and maintain websites built in the WordPress system is a great differentiator for anyone looking to land a digital marketing career. It’s also a valuable skill for those who own a business and need to have a professional site. So what is WordPress exactly? WordPress started—in 2003 before Facebook or Twitter were even a thing!—primarily as a place for people to publish their blogs online. From there, this system has evolved in an open-source environment—meaning anyone can freely add to and build the functionality—to now be a powerful content and website management and creation tool. WordPress is open to being used by any web developer of any skill level. WordPress powers hundreds of thousands of websites, from eCommerce shops to business websites to forums and pretty much anything else you can dream of. WordPress has many incredible features and is one of the most popular website building tools. 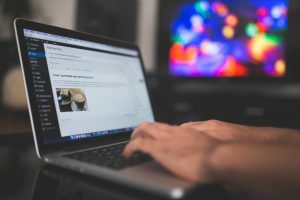 WordPress has remained an industry leader because its functionality is easy to use and the system’s ability to install already-developed plugins and widgets allows any website to be fully customized, making the need to add complex functions (like an image slider or shopping cart) a breeze. If you’ve found yourself looking for “WordPress Classes Near Me,” you’ve come to the right spot! The Digital Workshop Center offers a wide variety of web development classes for all levels including WordPress classes. We offer many computer classes that are available in both Denver and Fort Collins, Colorado, as well as online. Learn more about our classes and certificate programs here. Contact us to learn more about WordPress classes, financial aid options, course schedules, and how to get started.